Meteoroids with stable flights develop a high vacuum at their trailing side. The vacuum favors intensive degassing of volatile elements which, in turn, produces vesicles and sometimes larger bubbles or splash craters in the outer fusion crust. The longer the meteoroid maintains a stable flight, the more intense the degassing process and the resulting frothing formation. Though most common on the trailing edge of meteorites with stable flight attitudes, the forming of bubbles and larger vesicles is not limited to those. The violent release, for example, of S from troilite, of H2O from serpentinite (in carbonaceous chondrites) or the release of CO2 during the combustion of graphite can lead to bubble formation on areas where one would expect it less; e.g., on the breast side or flanks of a specimen. While continuing its fall toward the lower regions of our atmosphere, the meteoroid encounters low temperatures, often well below freezing point. This leads to a further contraction of the just-cooled fusion crust. Frost forms on the meteoroid; under special conditions it may even develop a layer of ice. The thermal stresses induced by low temperetaures often lead to tiny weblike cracks in the fusion rind. These delicate structures resemble the crazing on fired ware and are called contraction cracks (see last image on this page). 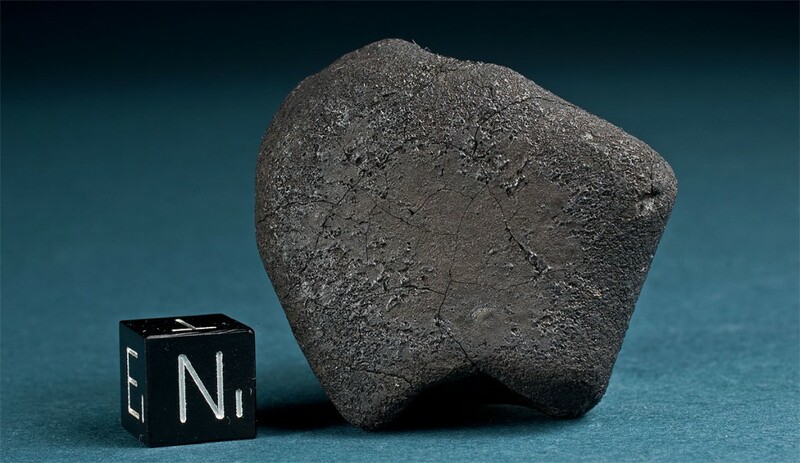 The color of fusion crust on stone meteorites is generally black. However, the quality ranges from a glassy jet black on basaltic achondrites (with vesicles as on crusts of lunar mare basalts) to a dull greyish black with shades of rich or lighter brown on ordinary chondrites. Frothy, transparent, olive-green crusts, as on anorthositic lunar highland meteorites, or bright whitish and ash-colored fusion crusts as, for example, on aubrites, are rare exceptions. The thin fusion crusts on irons show a blueish black often changing in tempered colors. In general, the color of the fusion rind is mainly a function of the iron content, the mineralogic composition of the meteorite and the range of melting temperatures and subsequent viscosity of the melt on the surface of the meteorite (Schneider, et al. 2000). Often, freshly-fallen chondrites display rather black fusion crust on one side and a more brown color of the crust on the opposite side. This is not a weathering effect. The color differences are due to variations in the magnetite contents in the crusts of opposite sides. These, in turn, are controlled by the supply of atmospheric oxygen and the temperature of the oxidation process. A high vacuum on the trailing side, for example, reduces or blocks the supply of atmospheric oxygen to the reaction. 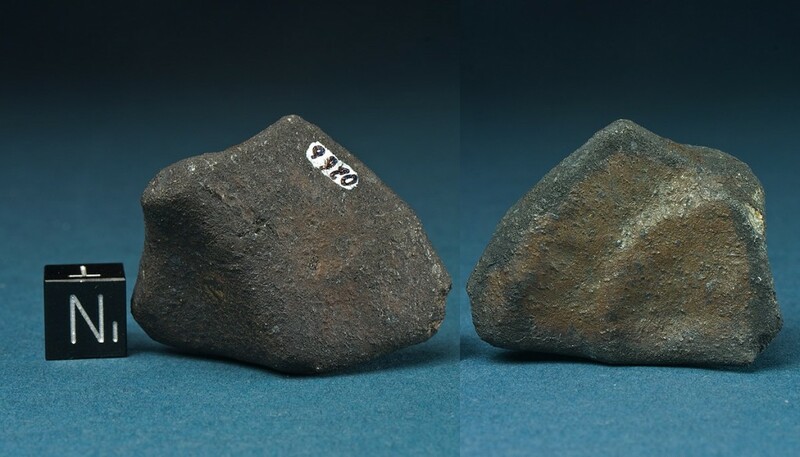 Meteoroids, particularly those of stone and of stony iron composition, were not built to withstand the enormous mechanical stress of atmospheric entry. They often break apart into clouds of fragments continuing their individual trajectories. A considerable percentage of the body’s mass is turned into meteoritic dust during these breakups. Fragmentation events are not limited to the hot phase of the flight and can occur subsequently during the complete trajectory until impact. Specimens crossing earth’s atmosphere in one piece develop a rather thick fusion crust and a high degree of surface ablation. Fragmentations which occurred at later stages of the hot flight produce specimens that show a far lesser degree of ablation. These are often only coated incompletely, or with an extremely thin layer of crust. Sometimes they only display a moderate sooting. A multiple fall arriving in the shape of hundreds or thousands of specimens on the ground shows a variety of transient and intermediate forms. Collectors and researchers alike try to categorize the differing degrees of fusion crust by adressing them as primary, secondary and tertiary crust. This makes perfect sense if several degrees of crust are observed on several surfaces of one specimen. But one has to be aware that successive fragmentations produce a fluid spectrum of gradually-decreasing manifestations of fusion crust. If comparing specimens of a multiple falls we suggest addressing a certain degree of fusion crust by referring to the time the crust formed relative to the progression of the meteorite’s flight. As Ramdohr (1967) and, later, Genge and Grady (1999) have demonstrated, fusion crust is not a homogenous layer but can be separated into an outer crust and an inner layer. 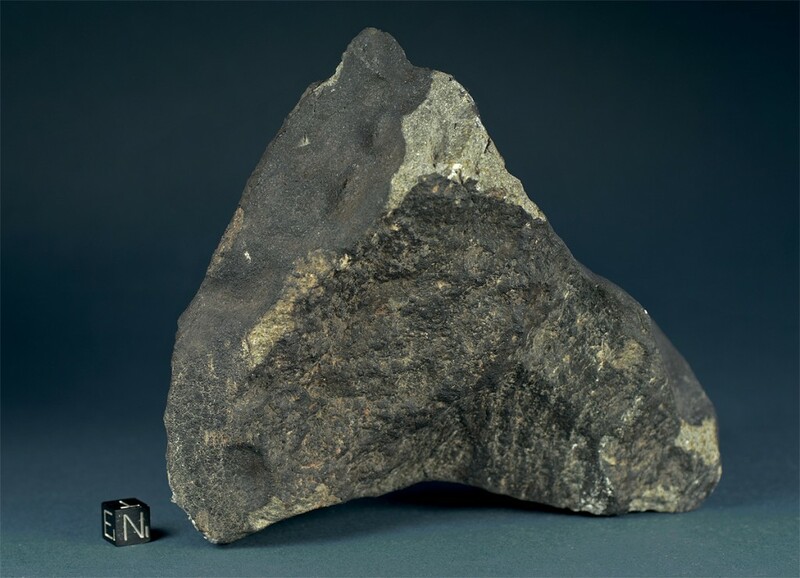 While the outer crust of stone meteorites is composed of entirely melted products of the meteorite’s original lithology, the inner layer (named substrate in Genge’s nomenclature) has experienced lower degrees of melting and is dominated by silicate glass veins and sulphide droplets. Morphologically the outer crust contains a high amount of very small vesicles of which the outermost are opening toward the surface. These vesicles can make up to 50 percent of the outer crust. The inner layer, or substrate, is rather compact and intersected by metal veins and droplets. 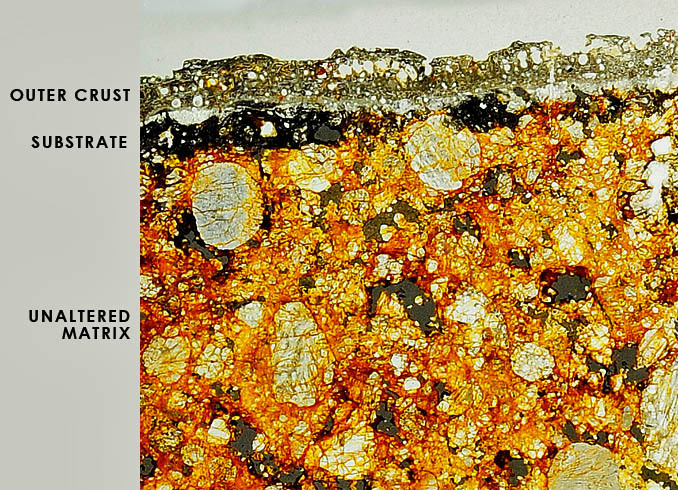 Under the substrate the meteorite’s mineralogy is unaltered by the heat generated during atmospheric passage. 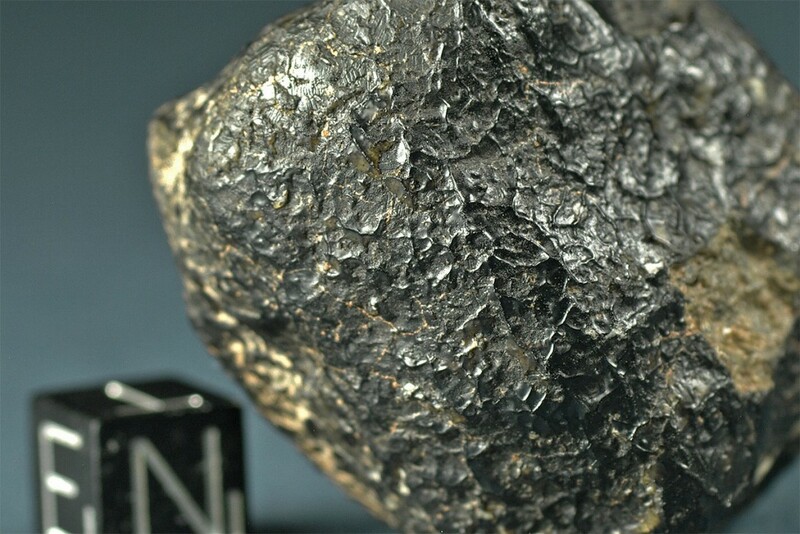 Because of their better heat conductivity iron meteorites usually possess a zone displaying a thermally altered crystal structure under their fusion crusts. This heat affected zone is called α2-zone and may reach as deep as 2 cm into the meteorite.